While Coachella is known as a music festival it’s become so much more than that. It’s about the Instagram shots. The influencers. The fashion and yes, even the rentals. 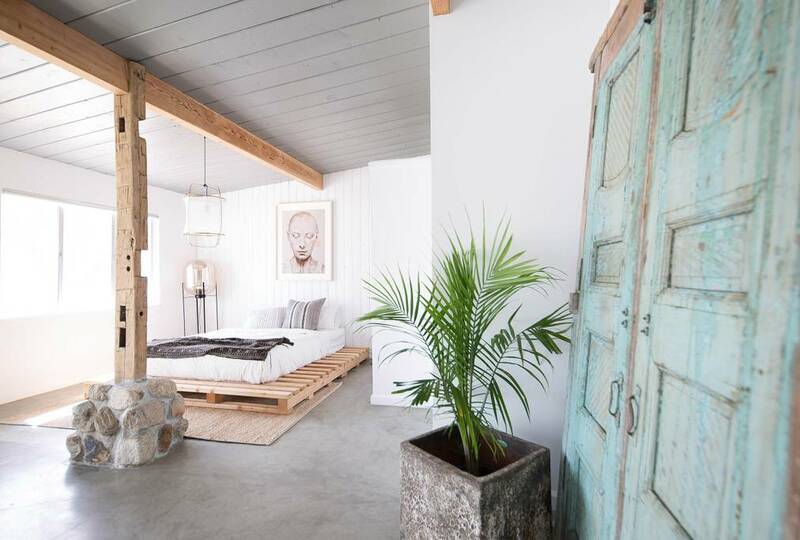 To make sure you have the full Coachella experience, we’ve chosen eight Airbnbs that you and your friends will love. 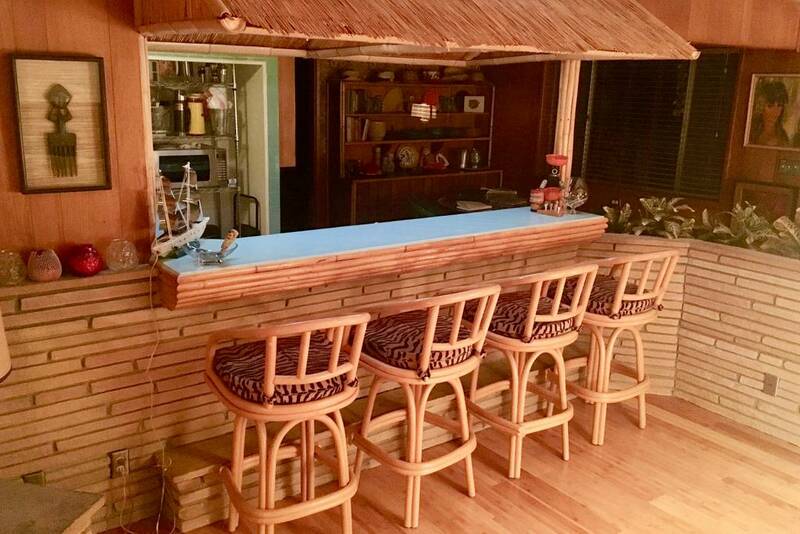 From places that are full-on mid-century modern to Airbnbs with their own tiki bar, these places will be as memorable to you as the music. 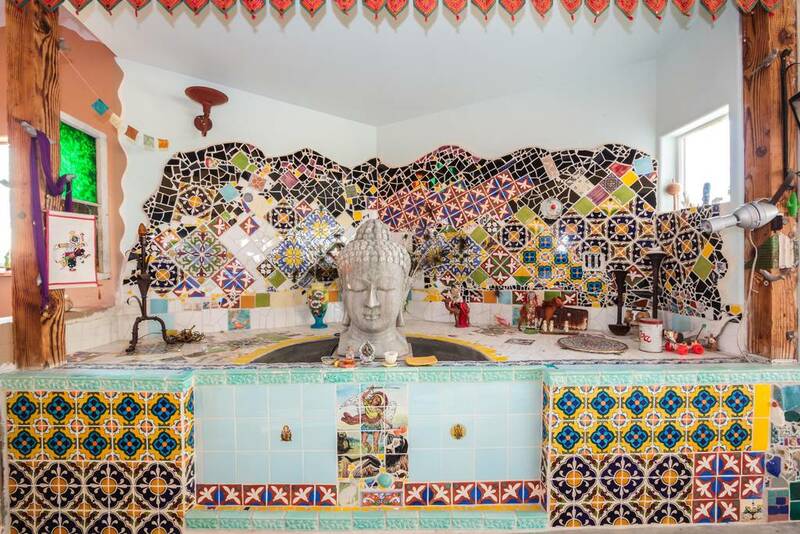 Part museum, part theater, part folk art piece, and part fantasy, this Airbnb made of tiles is like no other place you’ve ever seen, let alone stayed. 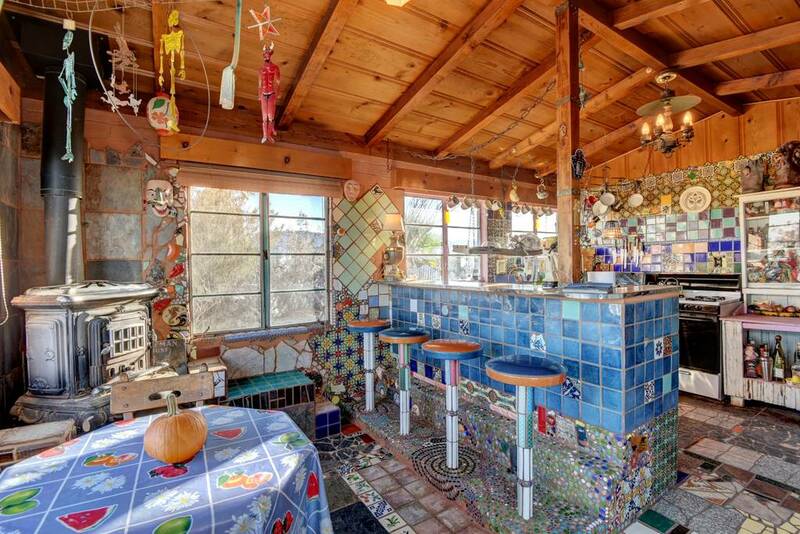 Seven minutes from the town of 29 Palms, this two-bedroom, one bath house has been evolving since 2000 and includes Mexican tile, stained glass, bottle pieces, and even some broken dishes. 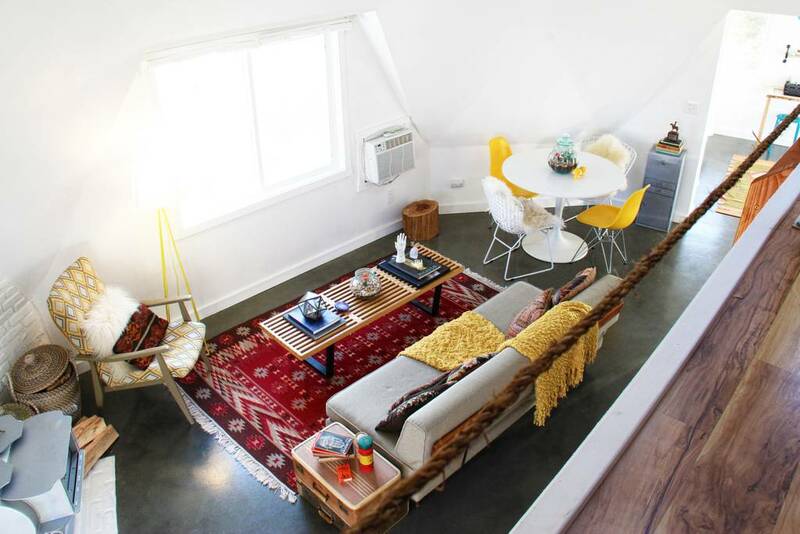 Add to that all kinds of colorful artwork, textiles, and nicknacks and you’ve got one amazing Airbnb for your Coachella experience. 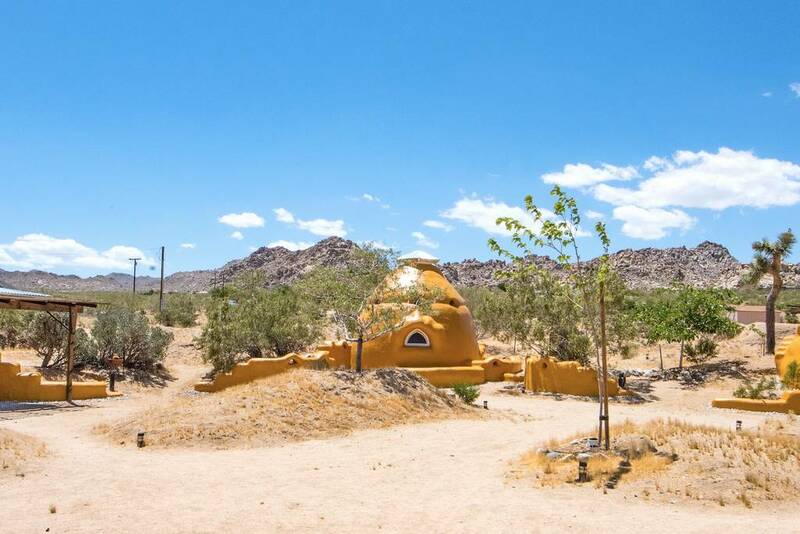 Sleeping up to four people this property, which is very close to Joshua Tree, will put you right in the middle of nature so don’t be surprised if you spot some owls, jack rabbits, coyotes, iguana, and even roadrunners. You may even be tempted to break some plates when you get home and grab some spackle! 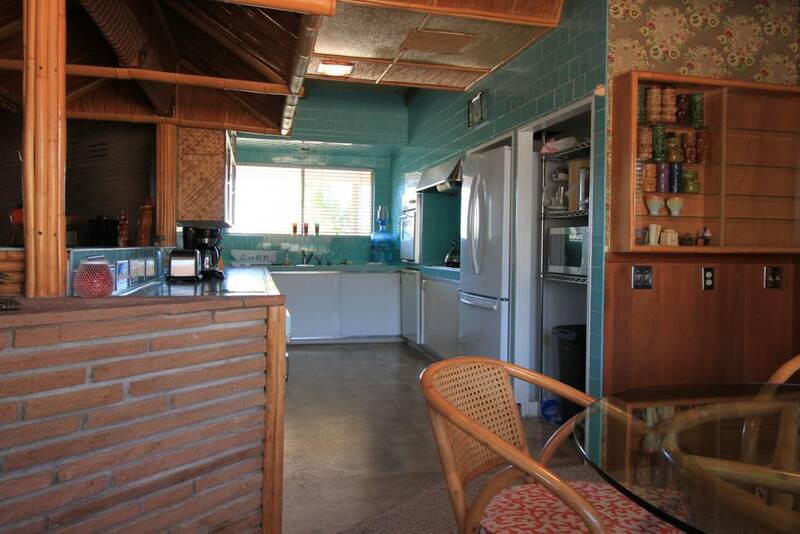 We know what you’re thinking and the answer is yes, the tiki bar in this amazing Joshua Tree Airbnb is original to the home and yes, that incredible kitchen tile as well as the built-in blender is original as well. 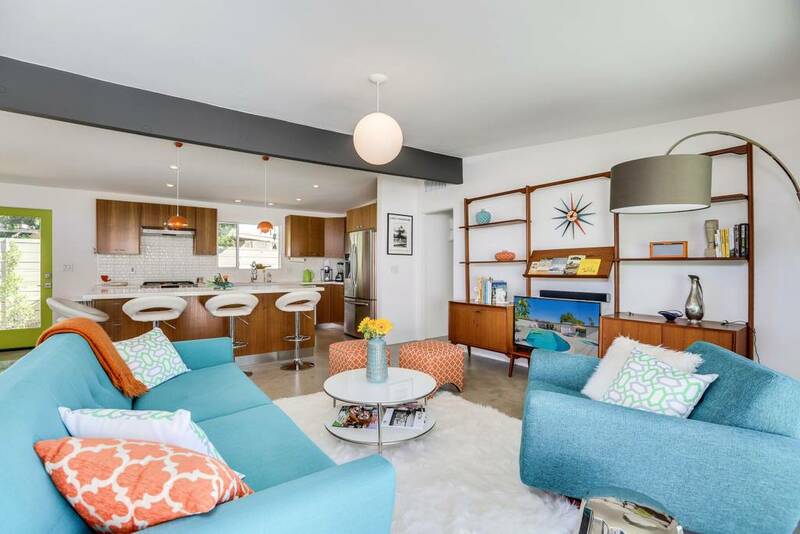 Built in 1959 as a place where the residents could really entertain, this property includes wood-burning fire places, not one but two vintage stereo systems as well as actual vinyl, a Swedish fire pit, outdoor dining tables with room enough for 12, two hammocks, a hot tub, and a front porch swing. There are even colored LED lights in the ceiling that you can adjust remotely. 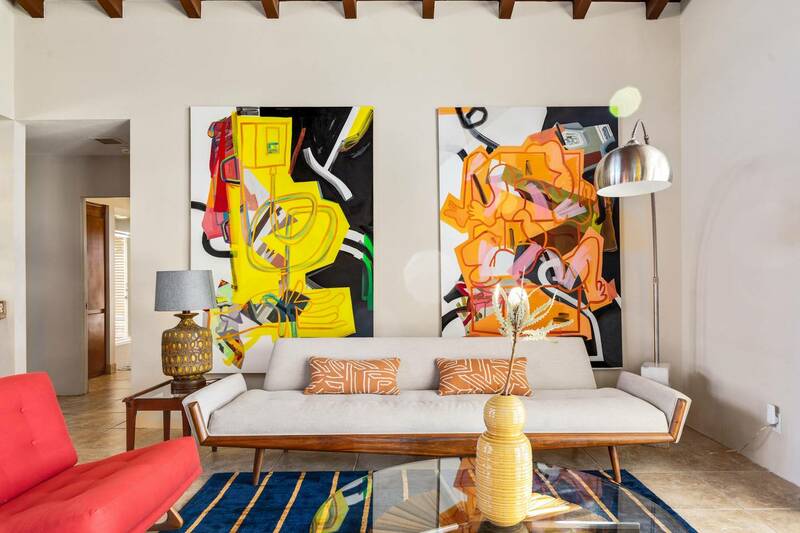 Meticulously curated with mid-century furnishings, dishes, and art work, this place will make you feel as if you’ve literally stepped back in time. Not to worry, though, there are plenty of modern amenities here like a new fridge, two huge TVs with ROKU, wifi, and a DVD player. For great area hiking, we recommend Coyote Hole where you’ll not only find some great hiking but some incredible petroglyphs as well. 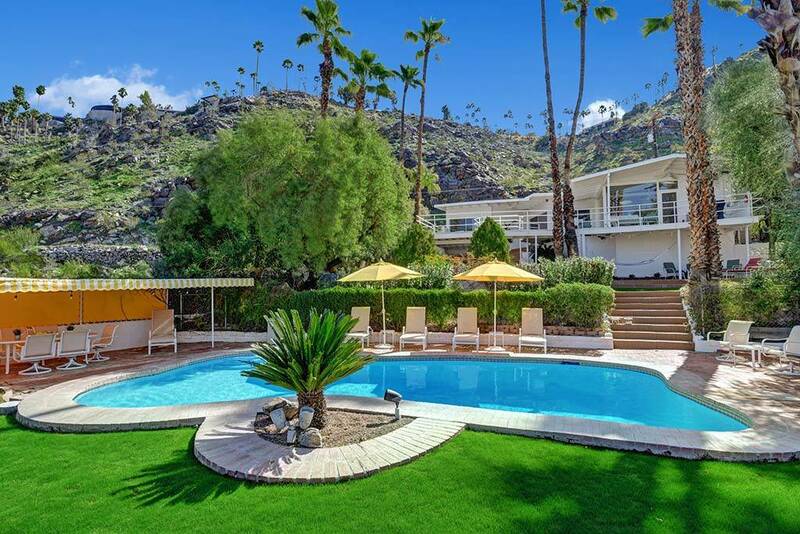 While you’ll be attending Coachella is 2019, you’ll feel as if you’re living in 1959! Be sure you mean it when you say you want to experience what life “off the grid” is like because if it’s not sunny, this place literally has no heat. 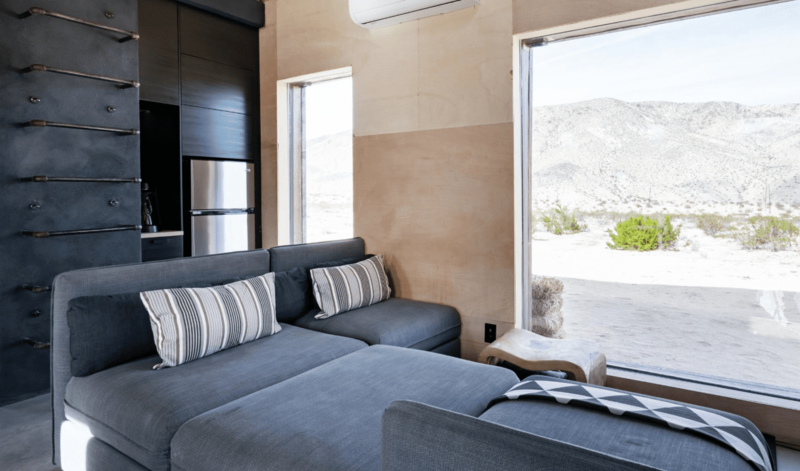 Run entirely on solar power, this remarkable desert house which sleeps six in its two bedrooms and one bath, actually offers wifi and TV, just not heating or air conditioning. 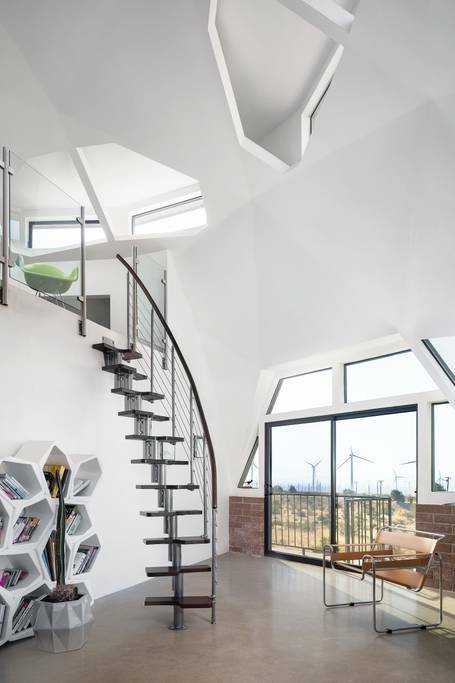 It also has an outdoor tub, shower, and even an open-air bedroom so you can gaze at the stars while falling asleep. 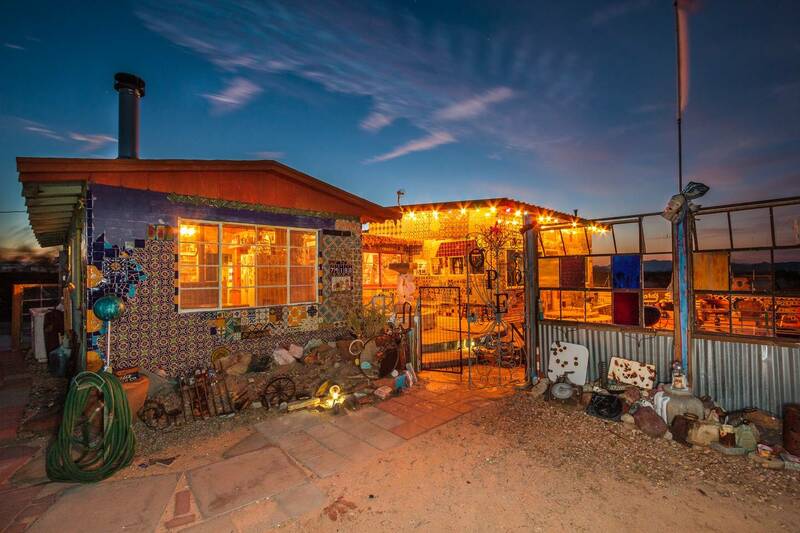 Located in 29 Palms, this Inland Empire Airbnb even offers rides to and from L.A. 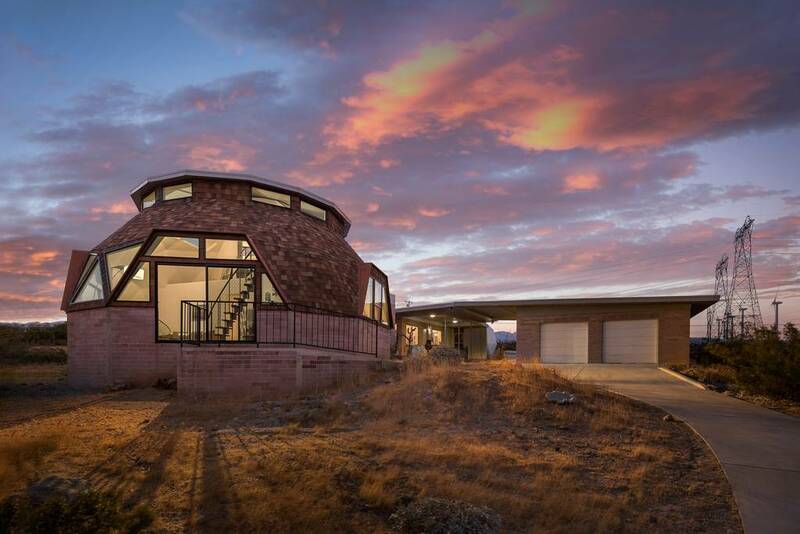 While you’re here, be sure to visit the Sky’s the Limit Observatory and Nature Center where you can learn about all the stars in the area’s famous “western skies” or spend time in the Meditation Garden. If you truly can’t get enough of the nightlife out here, catch a movie at Smith’s Ranch Drive-in theater. Just don’t blame us if you have a hard time concentrating on the movie! Not only are towels and extra blankets available but so are drums and rattles for your own, personal healing practice (it is California, after all!). 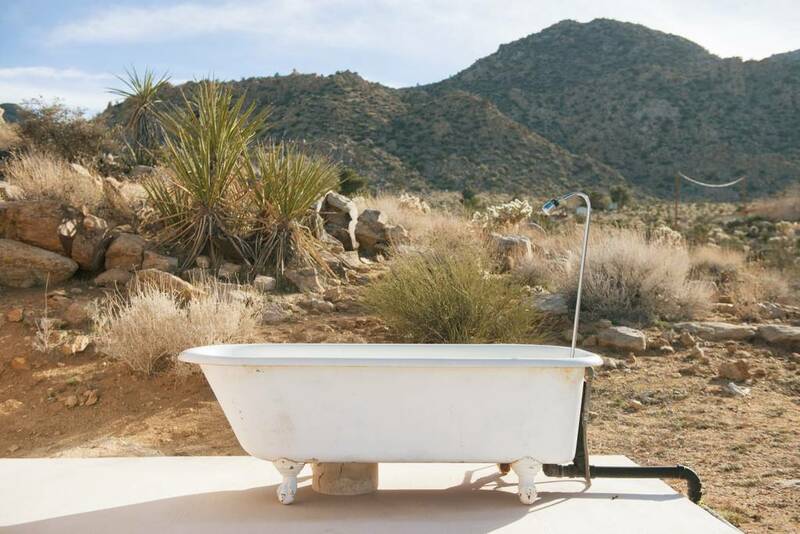 There’s also a “cold dip” tub in case you need to cool off from the desert heat and believe it or not, there’s also wifi, although with 18”-thick walls (they keep the inside cool in summer, warm in winter), indoor reception can be a little dicey but if you’re a true nature lover, you’ll love the excuse to just be at one with the desert! 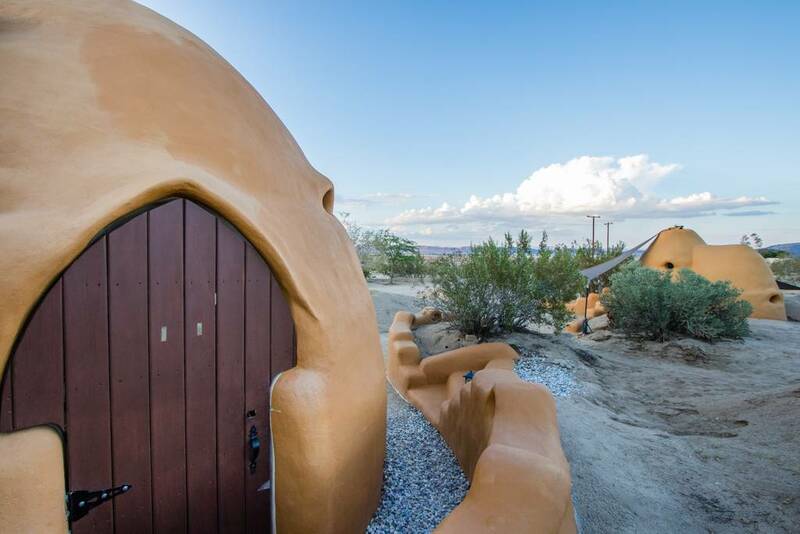 As you might have guessed, domes are a bit of a thing out here in the desert which is why we couldn’t resist including another one in our list. 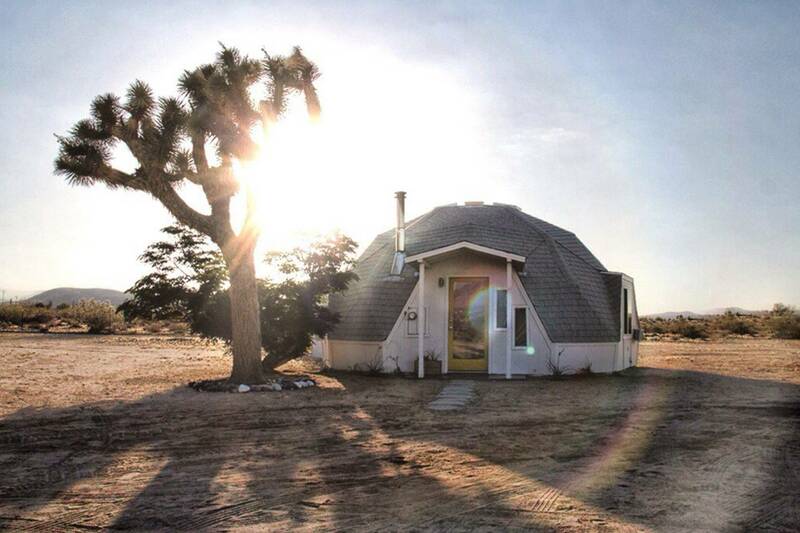 The Dome in the Desert as it is called sits on several acres of desert land, completely secluded but within a short drive of the town of Joshua Tree. 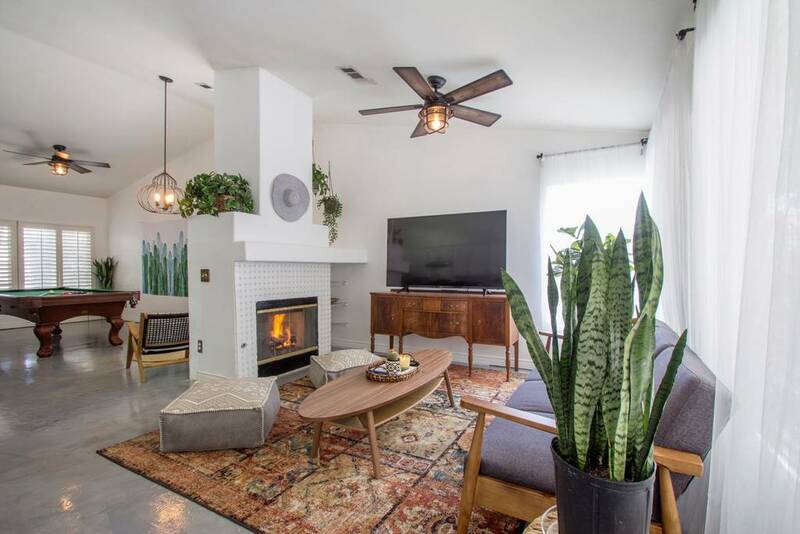 You’ll have to bring your own firewood (a wood burning stove keeps the entire Airbnb warm), but you’ll have access to wifi so you can post those Coachella Instagram stories right away but you won’t have a TV. If you’re a coffee lover, you’re going to be in heaven as there is a French press, a Moka Pot, and a drip coffee maker. 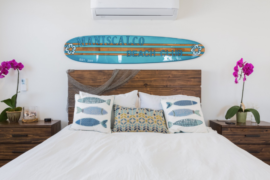 There’s also a memory foam king-sized bed in the master bedroom for those mornings you really want to take it easy. 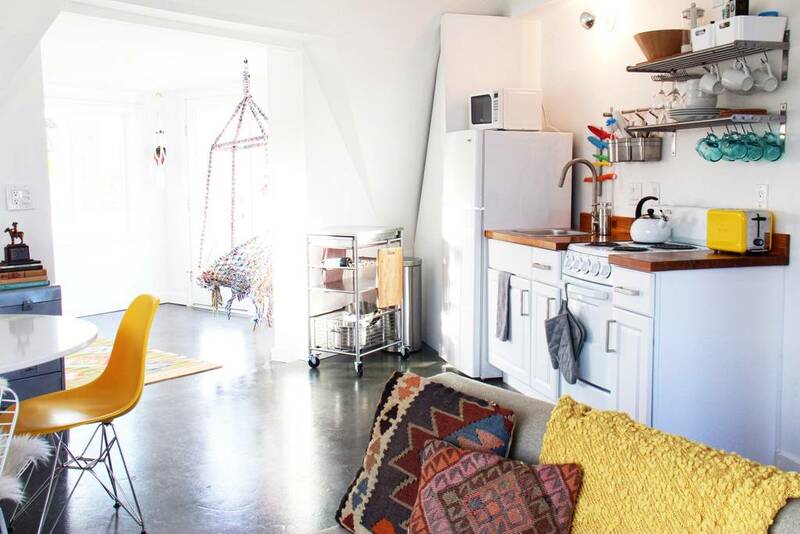 Decorated in an Anthropology-meets-antique store style, this Airbnb has been included in dozens of high-profile publications and sites like Condé Nast Traveller and Refinery29. 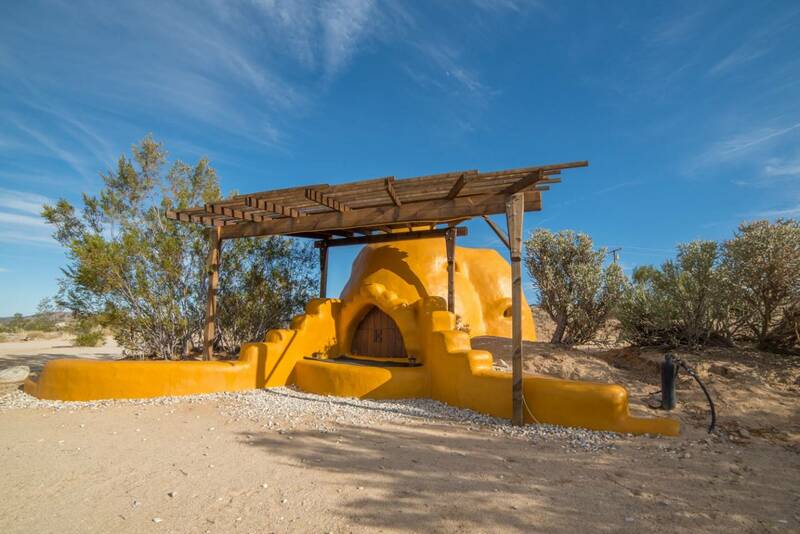 As if all the cool features here weren’t enough, this Airbnb comes with one really cool extra perk: Angela of Juice in the Desert, Joshua Tree’s “local juicing guru” will now be making her juices available to guests so look for the menu and pricing list you’ll receive once you book! That’s one way to keep your energy up for Coachella! 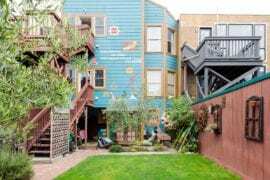 While this Inland Empire Airbnb is a little further west than most of our selections, it’s so unique that we just had to include it. 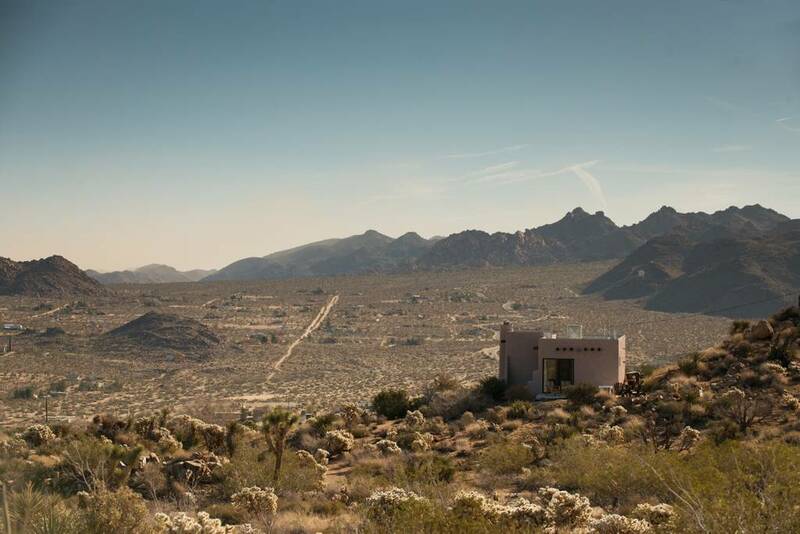 Emerging from the desert like a 1950s science experiment, this three-bedroom dome house sits on five acres right between Palm Springs and San Bernadino and it will come as no surprise that it’s appeared in books about architecture not to mention a few online design publications. 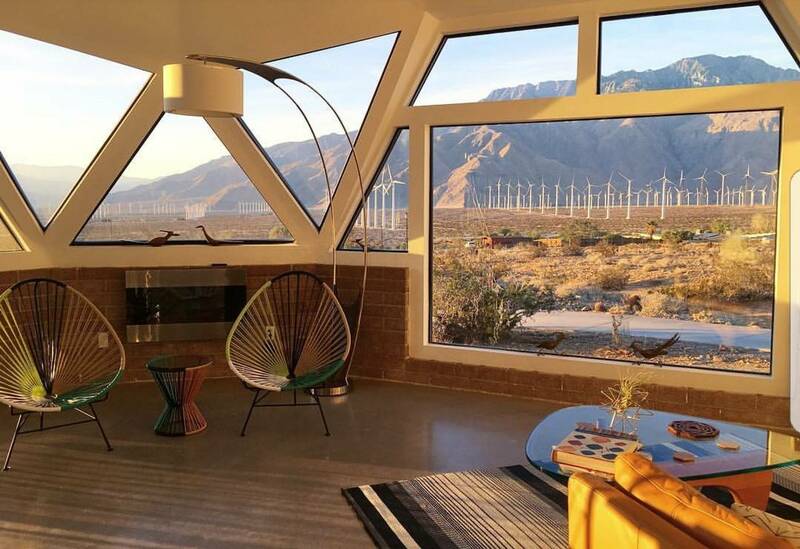 With dozens of skylights and 360° views of the world, you’ll be able to gaze at Joshua Tree Park, the Coachella Valley, the San Jacinto mountains and even the city of Palm Springs. 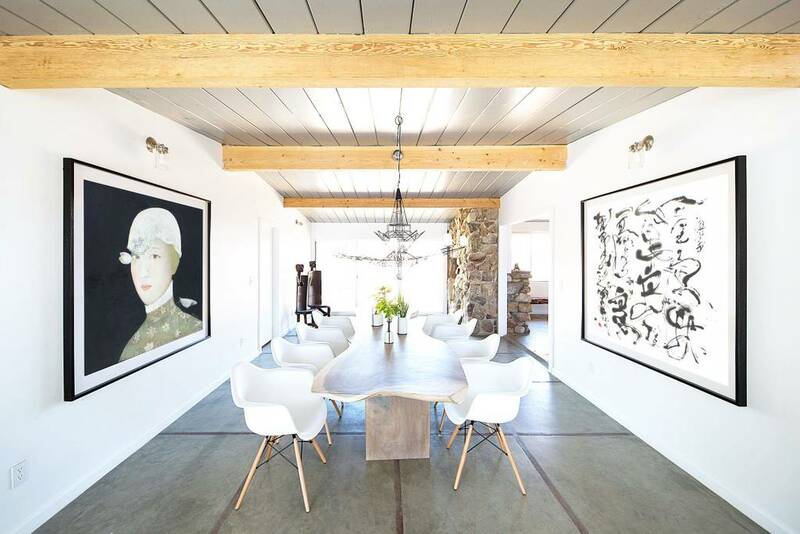 The living room features 26ft-high ceilings and the home itself is in incredible mix of modern technology and mid-century design. With strong wifi (you can actually see the signal tower up on a nearby hill), Roku, Netflix, and Sling TV, and good mobile reception, you’ll be able to post those festival pictures up at night and watch your followers grow by morning. 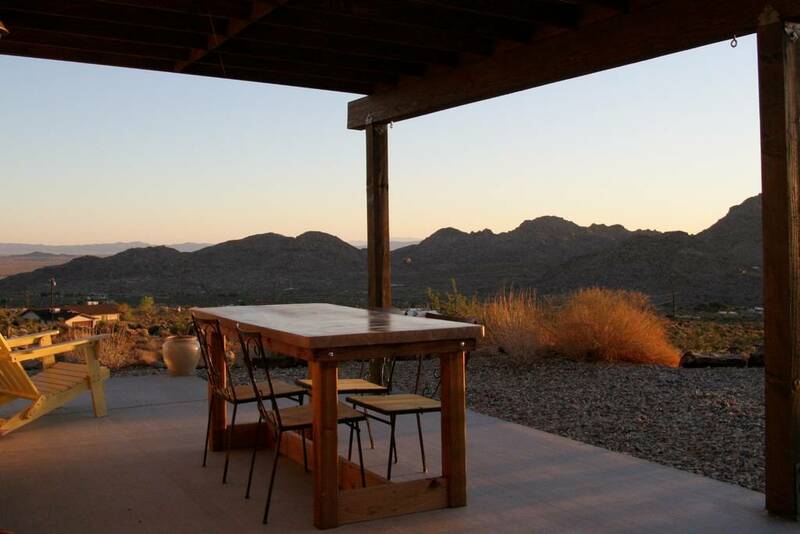 In addition the remarkable views from the house, there’s an covered dining area that allows you completely unobstructed views of the entire area. Whatever you do, just make sure you follow the directions the host provides. The dirt road here are tricky if you don’t pay attention, you might end up in the Sahara. If you’ve ever wanted to see Santa Fe, but haven’t been able to get there, this is absolutely the next best thing. 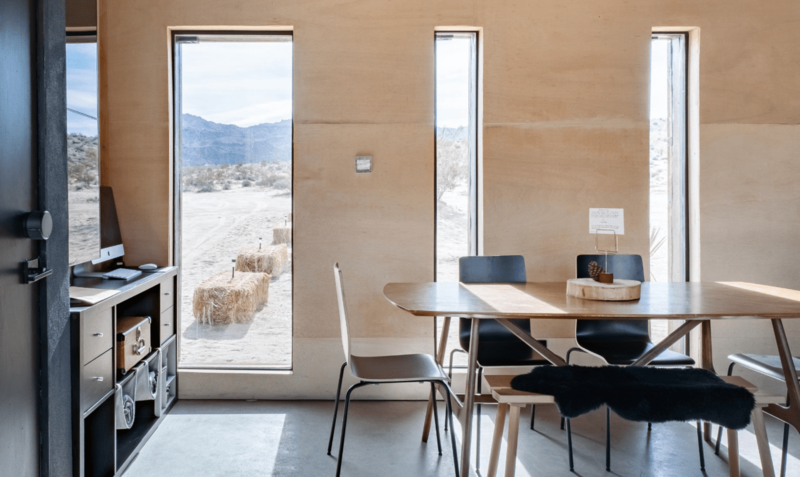 This stunning adobe desert Airbnb sits on two-and-a-half acres right on the hills the border Joshua Tree National Park. 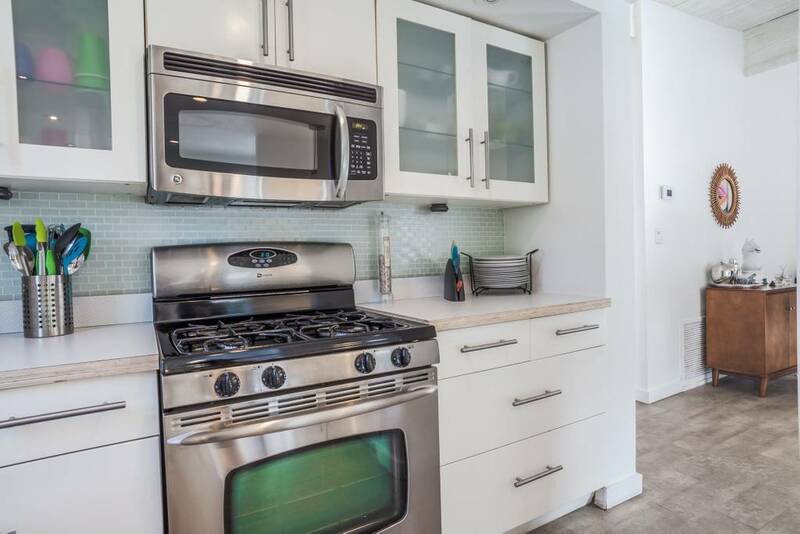 With two bedrooms and two baths, this home will accommodate up to four people and offers a newly renovated kitchen (although you can always go into town to eat. Don’t miss breakfast at Country Kitchen or Pappy & Harriet’s for BBQ and entertainment). 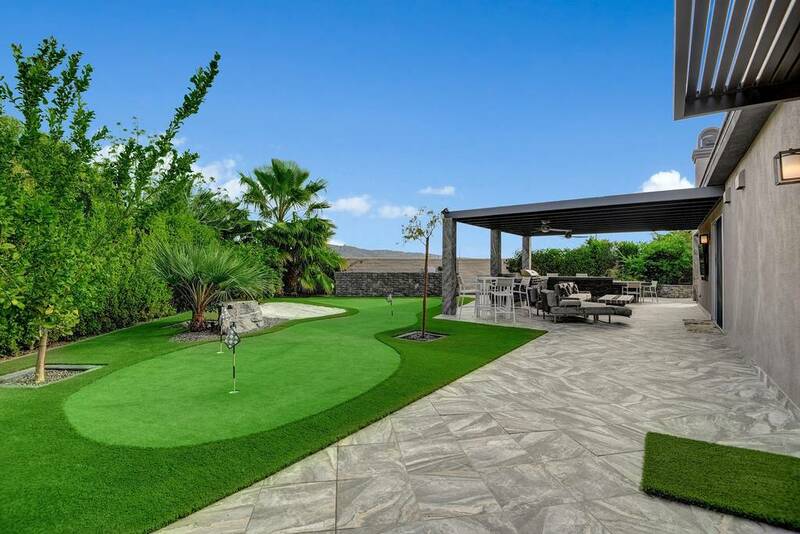 You’ll have no problem tracking the course of both the sun and the moon between the three patios that offer 270° views. And best of all: You can watch it all from the outdoor clawfoot tub. 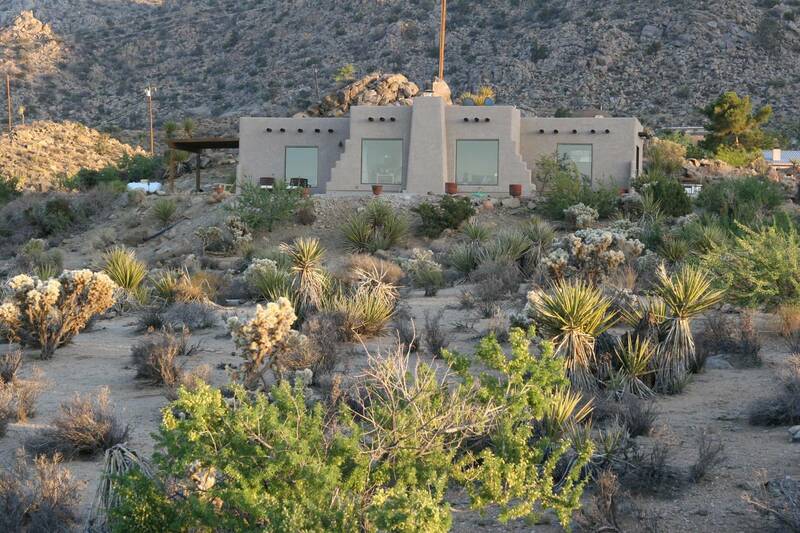 If that’s not desert living at its finest, we don’t know what is! 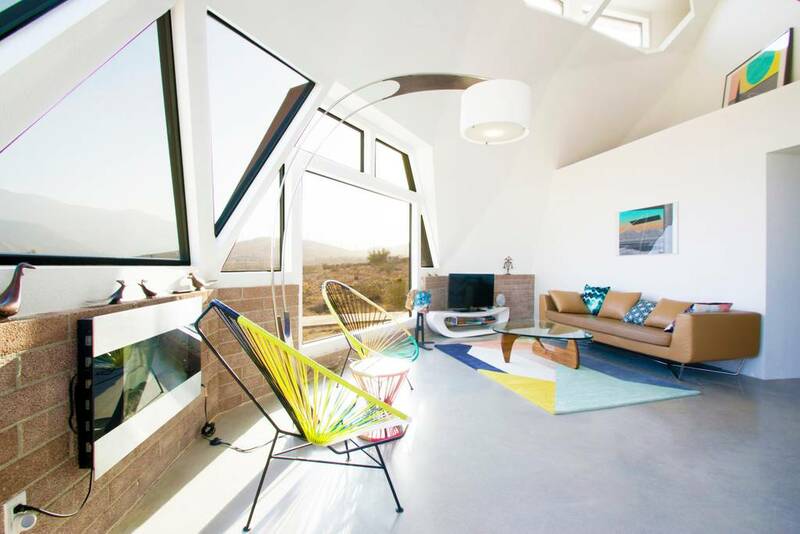 Normally most masterpieces in Joshua Tree are in the sky, but in the case of this Airbnb, they’re on the wall. 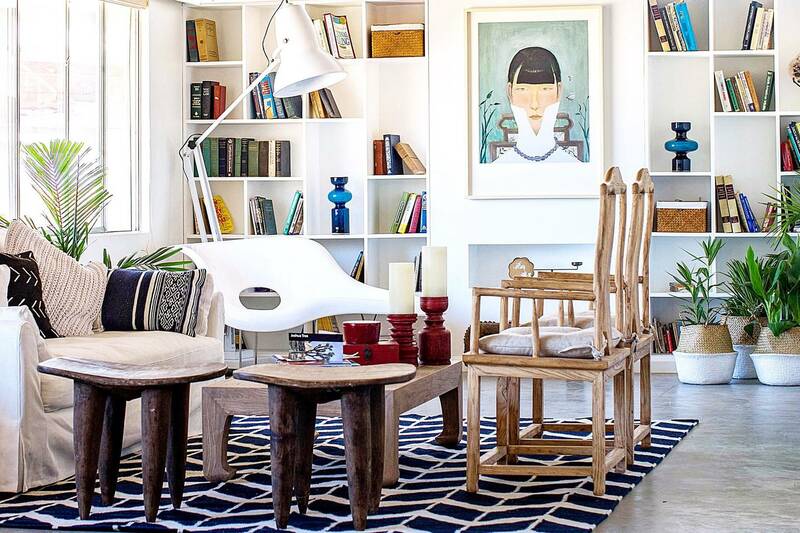 This stunning art-filled home is full of treasures from Asia and Africa which complement the space beautifully. Having been recently featured on the cover of a major local magazine, this home is in high demand which will surprise no one. 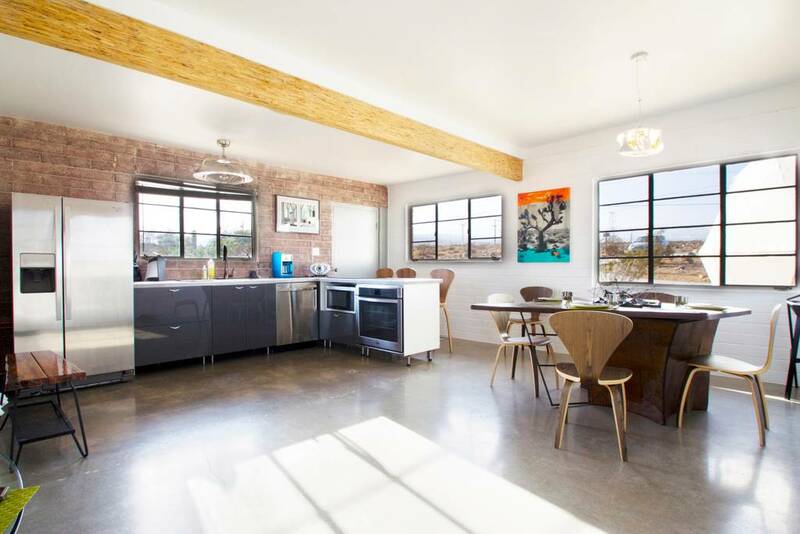 This 1950s ranch style Airbnb is decorated with a clean, modern aesthetic and has all the usual conveniences like wifi and air condition. 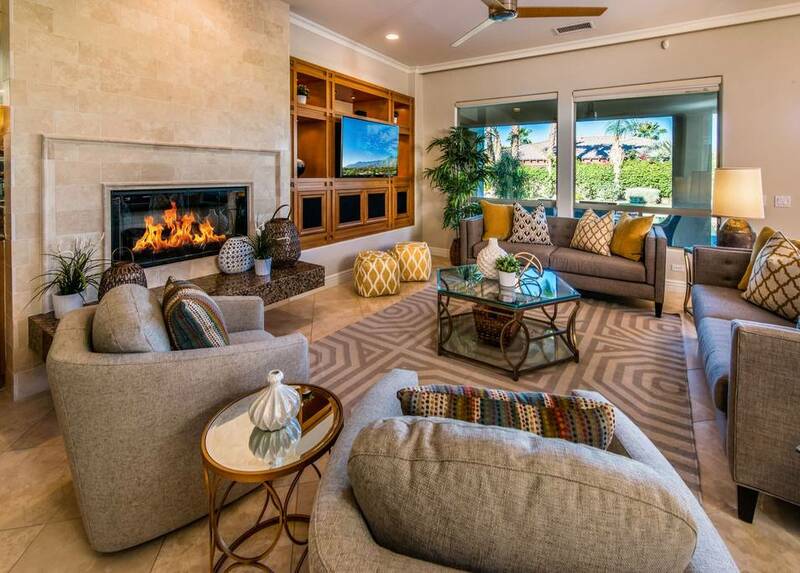 As gorgeous as the inside is, the outside is equally extraordinary with a big jet spa, fire pit, and backyard BBQ area, so you won’t miss a moment of the show outside. 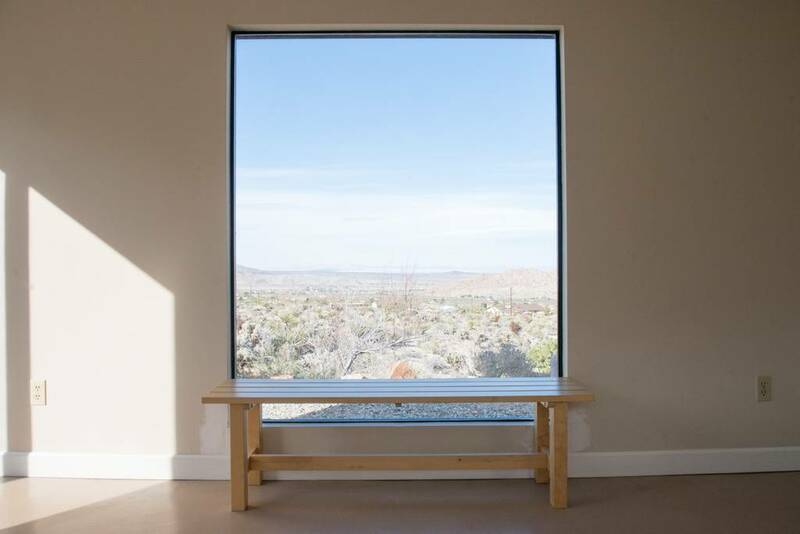 Just minutes from the entrance to Joshua Tree National Park, you can be out and exploring or in town in no time. That’s what you’re going to be asking yourself after you hear just how many amenities this place has. 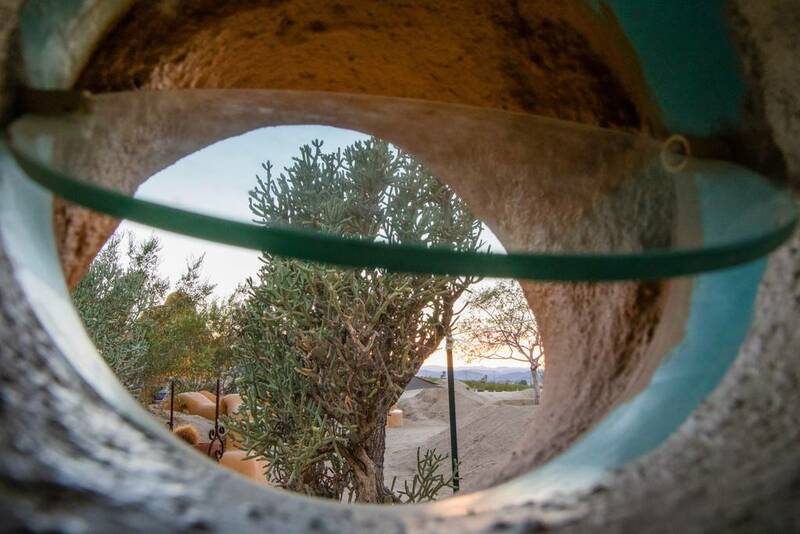 When you’re not out listening to Childish Gambino or Ariana Grande, you can be practicing your swing on the putting green in this Indio Airbnb. Or you can swim in the saltwater pool. Or use the projector to see a movie, shoot pool or play a game of ping pong. There’s even a gym with weights and a Nordic Track so you can keep your energy up for all those performances and long nights. 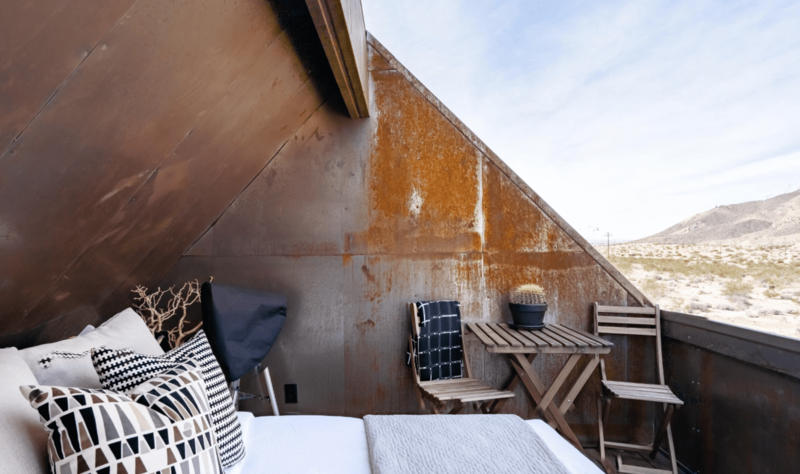 There are also multi-level decks, an outdoor kitchen featuring built-in appliances and no less than three fire pits not to mention an outdoor Sonos playbar. 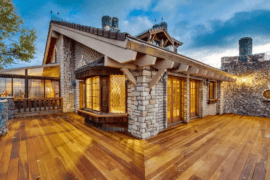 Sleeping up to ten, you and your friends can divvy up the four bedrooms and three-and-a-half baths among you but we recommend holding out for the master since it has a little kitchenette in it. Best of all, you’ll be five minutes away from the Empire Polo Fields where Coachella takes place! 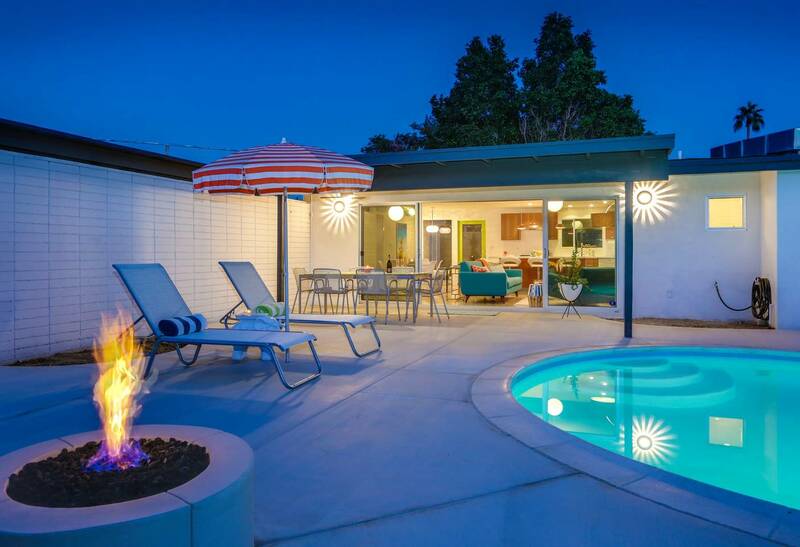 If Coachella had been around in the middle of the 20th century, this is where old Hollywood would have stayed. 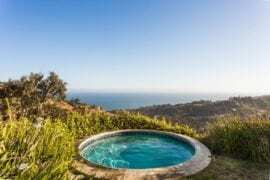 Originally owned by Howard Hughes, this estate later passed into the hands of Eva Gabor and was a favorite vacation spot of Smokey Robinson. 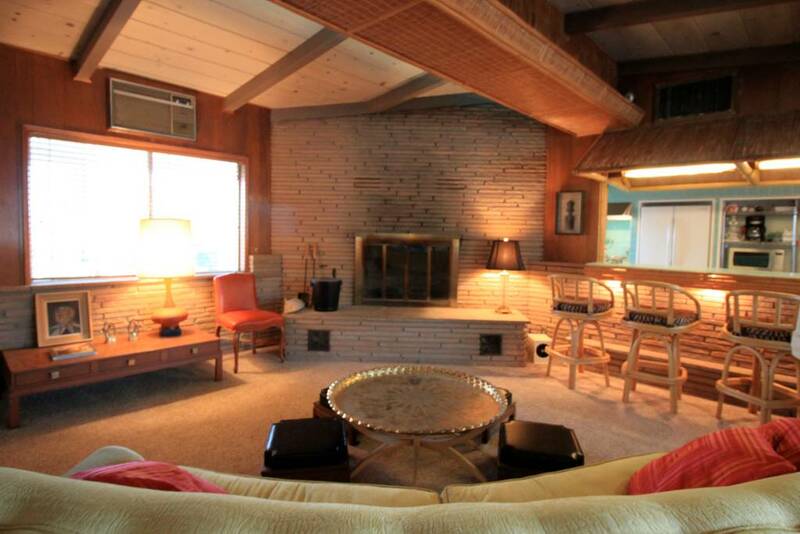 The Araby Cove mid-century gem is super spacious and looks almost untouched since the 1950s. 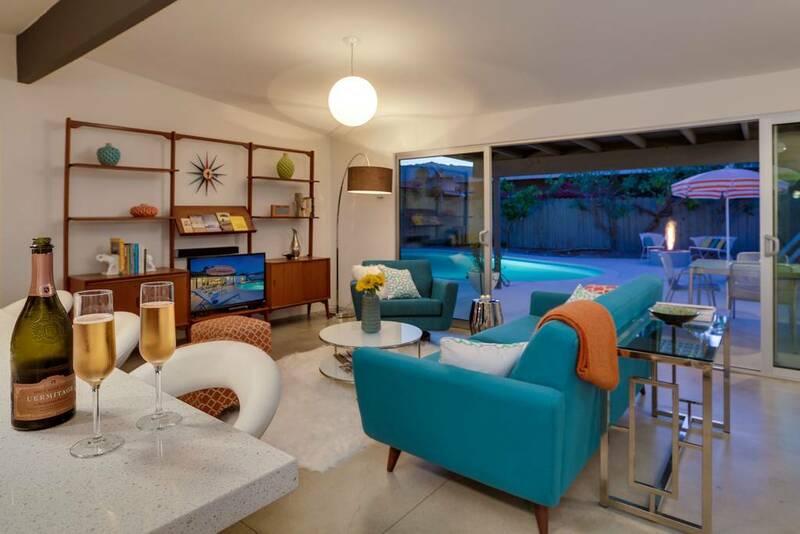 Complete with great amenities like a wet bar, vintage appliances, pool (and an adorable cabana), and hi-def TVs in each of the three bedrooms (which also happen to have en suite bathrooms, by the way). 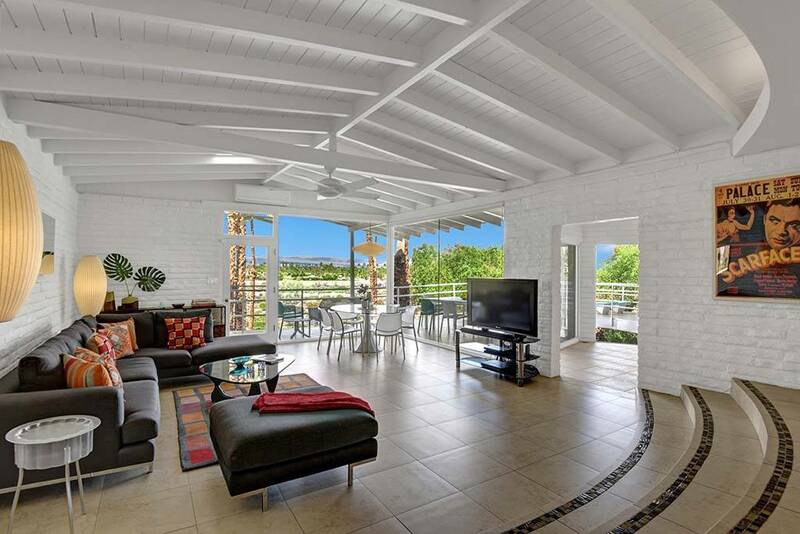 The floor-to-ceiling glass walls offer an incredible view of Palm Springs. 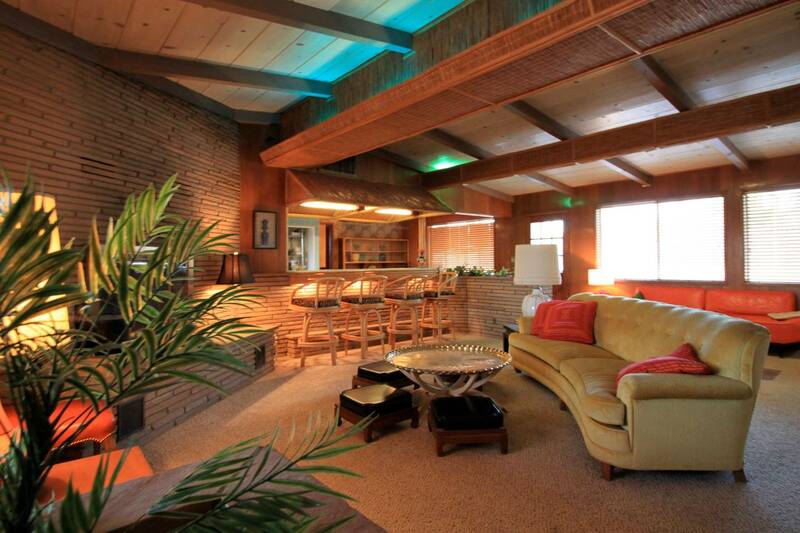 Best of all, this grow-up party house is just a half hour drive from Indio! 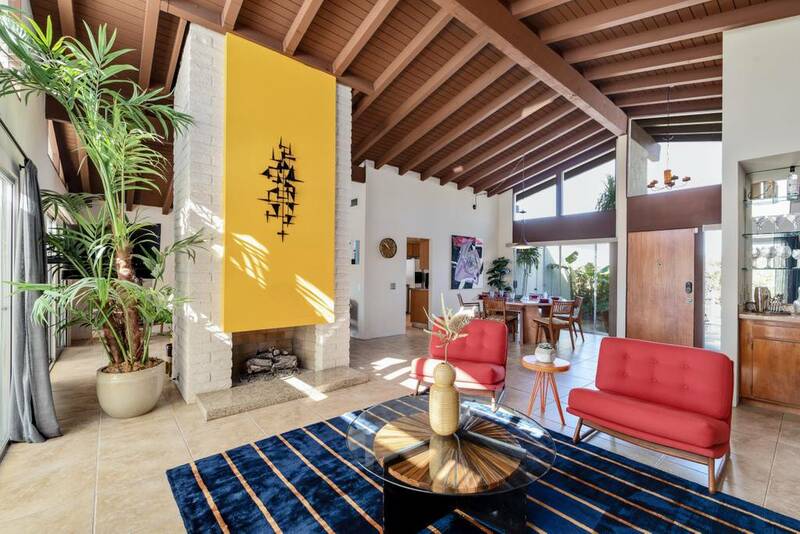 Just 20 minutes away from where Coachella is held in Indio, is a mid-century modern masterpiece that will make you and your friends feel as if you’re in a Slim Aarons photograph. 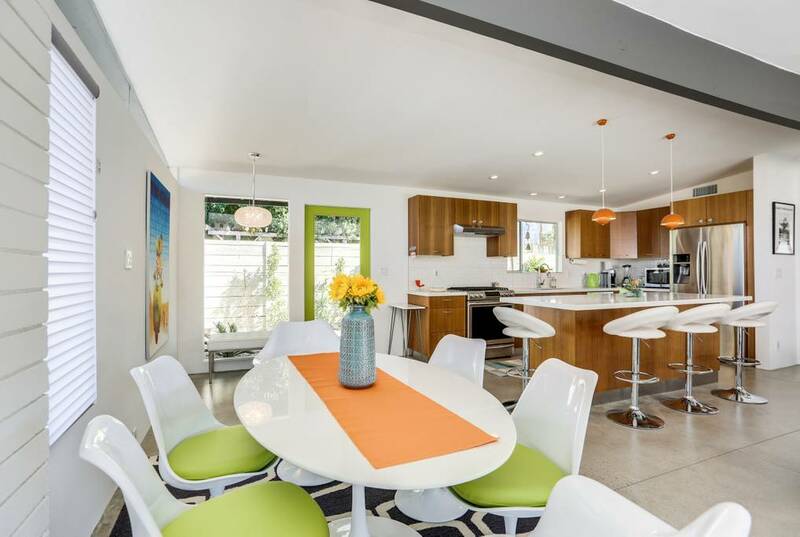 This sun-filled two-bedroom Palm Desert home has just undergone a remodel so everything feels fresh and new. There are new TVs in the bedrooms and a brand new washer/dryer set not to mention wifi, cable, a Nespresso machine, a pool, a spa, outdoor fire pit, toiletries from Mario Badescu spa, a magnifying mirror (although we’re not sure whether that’s good or bad) and even a selection of current magazines! 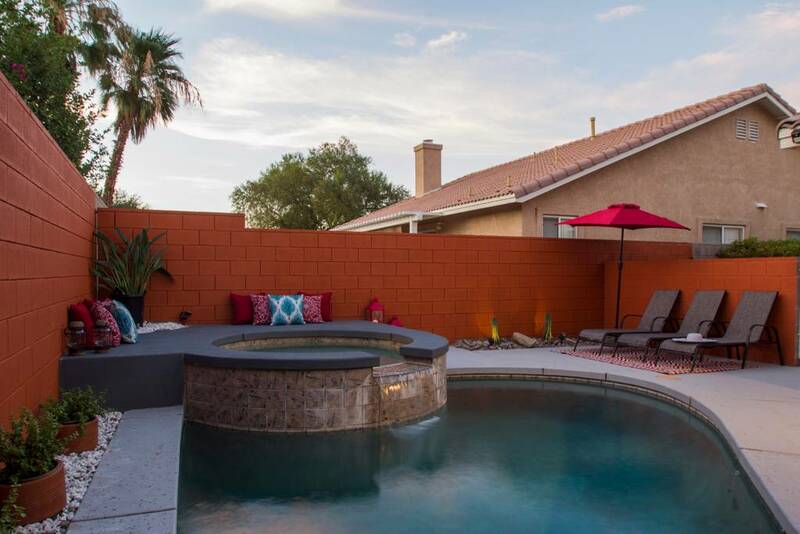 “Plumeria Sands” as this Airbnb is known is located just 20 minutes fron Indio and close to so many area attractions like the Living Desert Zoo and Gardens, the famed La Quinta Spa, and the Agua Caliente Casino. That’s if you can pull yourself away from Coachella! If there’s one name that gets hearts racing in this part of the world, it’s “Alexander”. 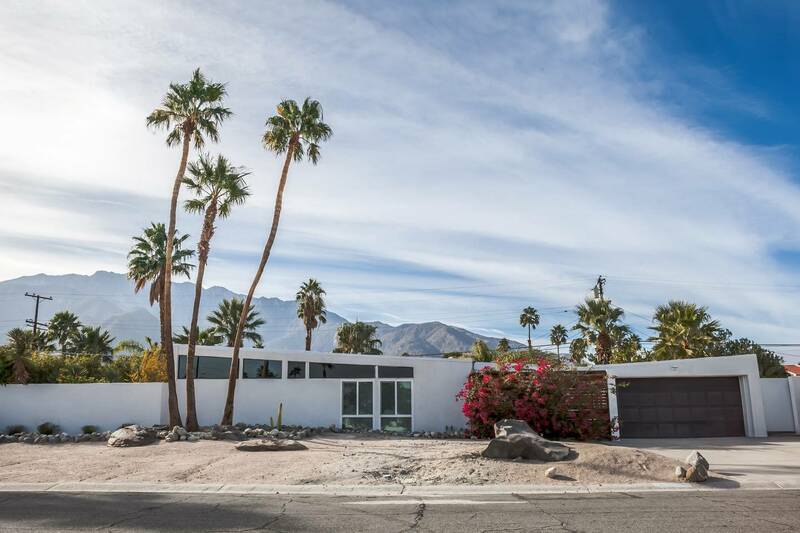 A reference to the construction company that built over 2,000 homes in the Palm Springs area in the middle of the 20th century, the word is spoken here the way “Stradivarius” or “Rolls” is mentioned by connoisseurs of those companies. This particular Alexander sleeps six in three bedrooms and is just about 20 minutes away from the goings on at Coachella. 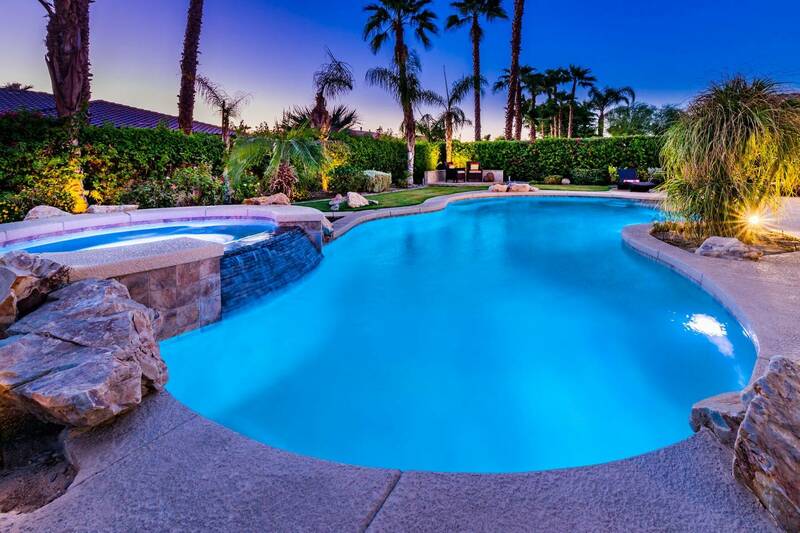 Like most houses in the area, this one is complete with a pool, although this one has a built-in “Tan deck” (an umbrella literally fits into the pool so you can adjust your light). 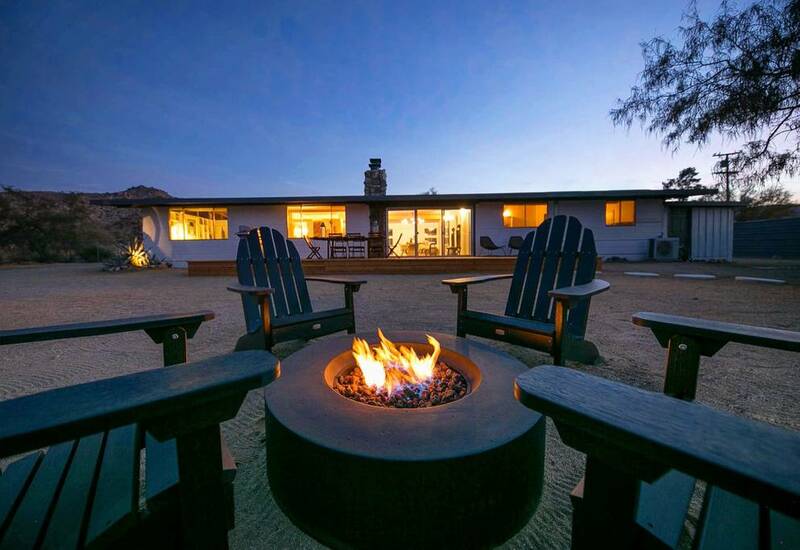 When those desert nights start cooling down (and they will), there’s a six-foot fire pit you can cozy up to not to mention an outdoor ping pong table. As long as you’re in a mid-century sort of vibe, we recommend a visit to The Parker hotel even if all you do is have a drink and some small plates at their bar, appropriately called “Mini Bar”. Don’t look now, but you’re about to become the favorite of all your friends. 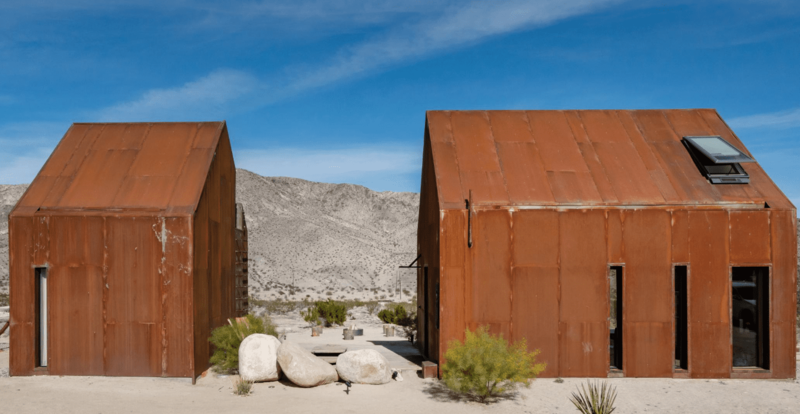 This Indio Airbnb is so close to Coachella you can actually walk there! That means you can forget all the Ubers, the shuttles, the waiting, and most of all the price gauging and just plain stroll over! 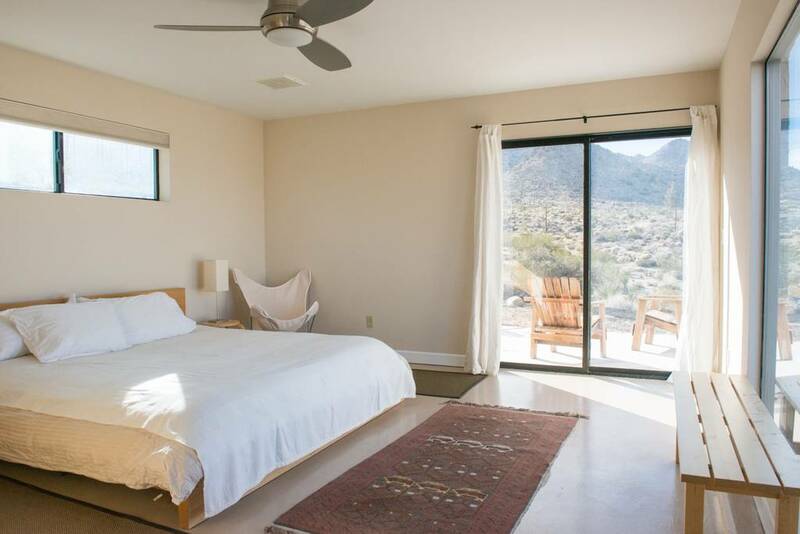 This four-bedroom, three bath home sleeps ten and all four bedrooms have sliding doors that lead to the outside patio so you can all have pre- and post-festival get togethers! 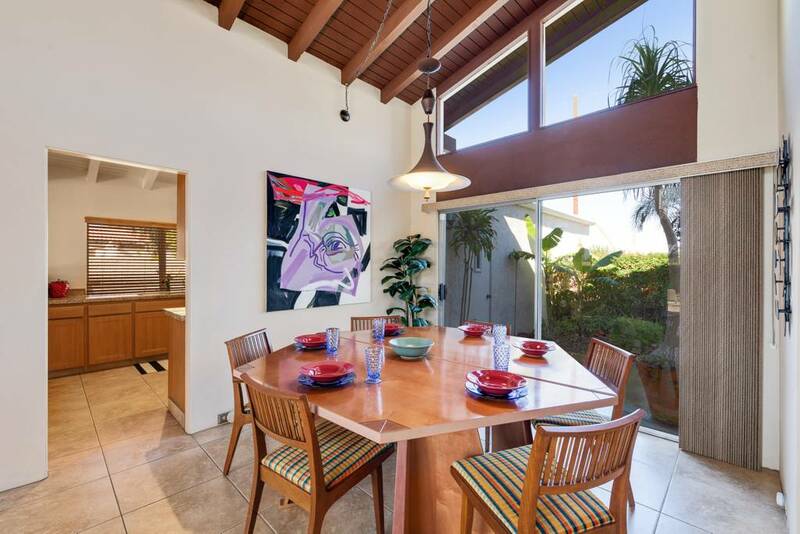 This 70s-style home has a great art collection, salt water pool with a tanning ledge, gas fire place, wet bar, a jacuzzi big enough for eight (you’ll have to decide who gets left out), and three cruiser bikes (although you probably shouldn’t try to take those to Coachella). 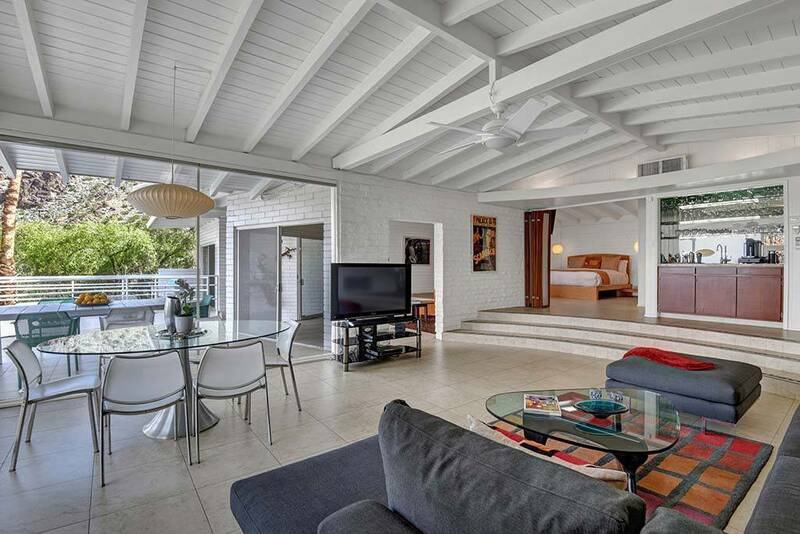 Known as the “The Pearsall” house, this Airbnb is located in a gated country club, it also has access to a 27-hole course if you want to hit the links. As the sun in this window-filled house can be strong, there are also blackout curtains so you can sleep off your hangover in peace. 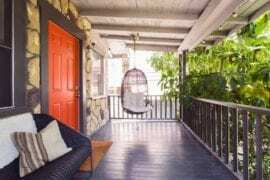 With a modern sensibility and a grown-up vibe, this La Quinta Airbnb is the perfect refuge when you’ve decided you need a break from all the crowds and noise at Coachella. 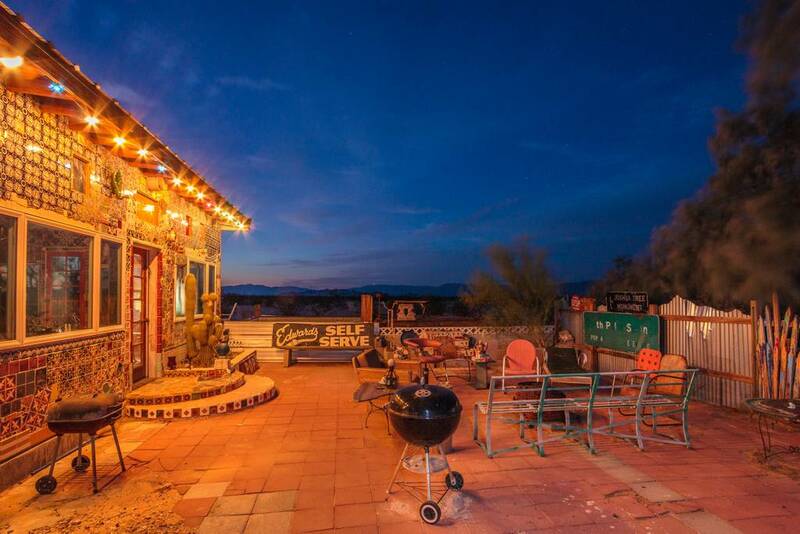 This four-bedroom, one-story house sleeps ten and has enough to keep you occupied even when the bands aren’t playing. 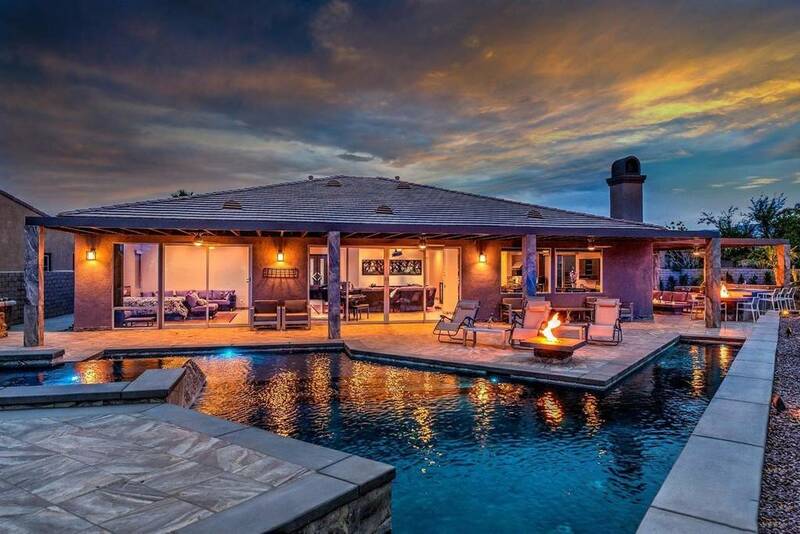 With a basketball hoop, a waterfall feature, a hammock, BBQ, outdoor dining area, a pool, a spa, a fire pit, air hockey, and even a pool table, this place is a true calm away from the storm. If all the partying is getting you, there’s a nearby park with a fitness court so you can keep yourself energized. With a 65” smart TV, you can also just relax with a movie or binge on your favorite reality show. You’ll only be about four miles from the Empire Polo Grounds and if you decide to take a few days before or after Coachella, there’s plenty to do like have a date shake (as in dates that at the Shields Date Garden or hike the Palm Desert Cross Hiking Trail or rent a bike at the Old Town La Quinta Bike Rentals. For dining we recommend LG’s Prime Steakhouse for dinner and Shermans’ Deli for breakfast which you’ll probably need after a long night of concert going! OK, start thinking about whom you’d like to invite because this place has no less than 23 beds. That’s right! 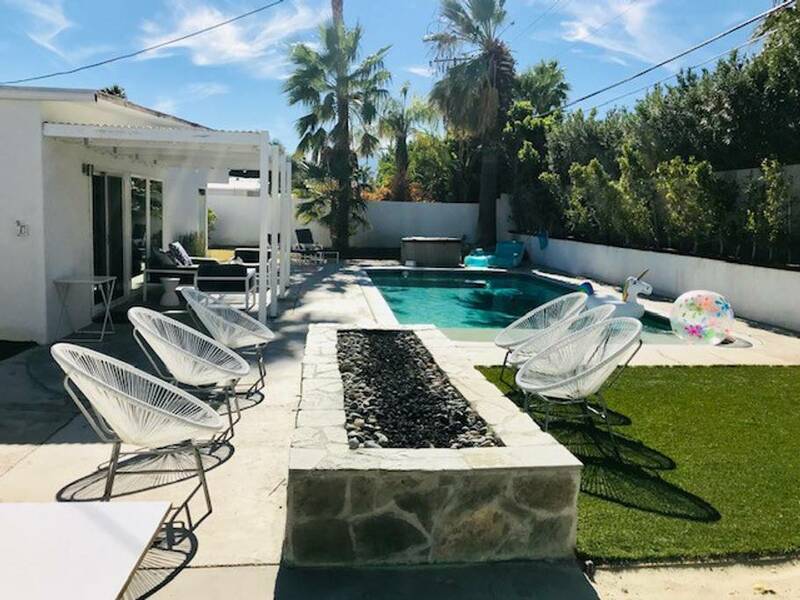 With ten bedrooms and seven bathrooms, this place has enough space to share with just about everyone you know who’s going to Coachella this year. 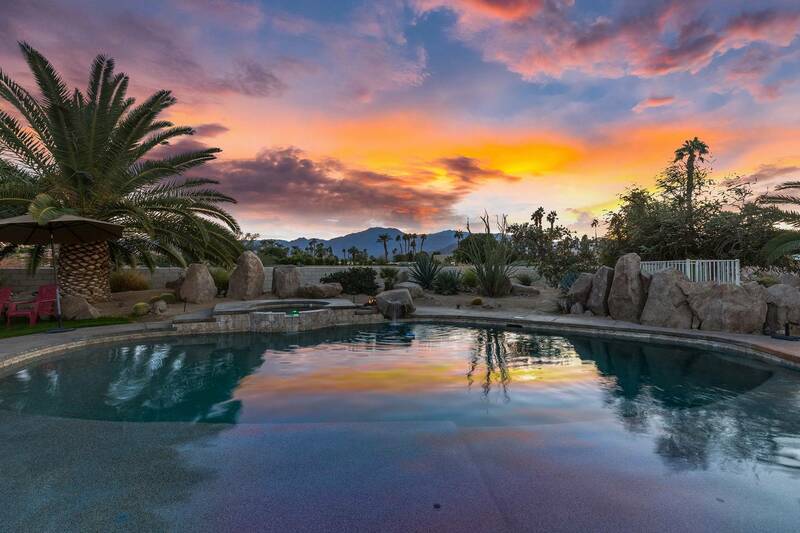 Used for weddings and large get-togethers, this Indio mansion has amenities you never even realized you wanted like a lake full of fish and even ducks (you can take your pre-festival Instagram shots on the bridge!). There’s also a private pond full of Koi not to mention a waterfall. 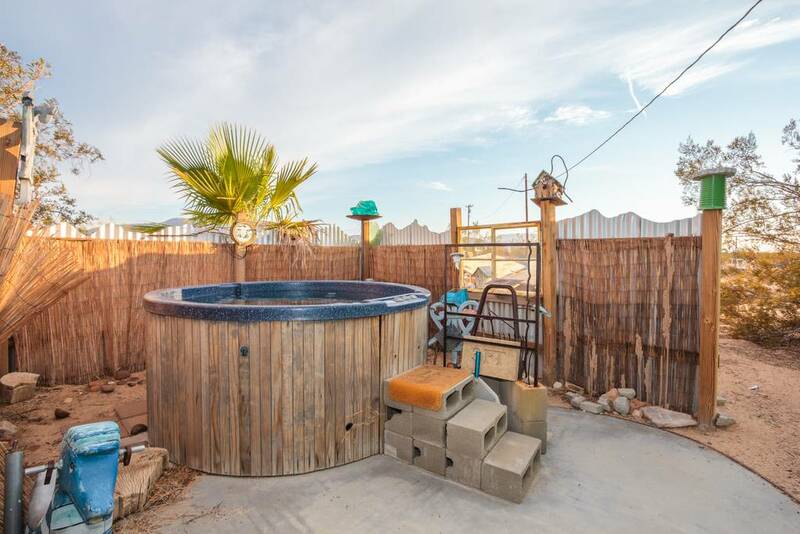 As if that weren’t enough, there’s a basketball hoop, ping pong table, pool table, and of course, an actual pool and hot tub. 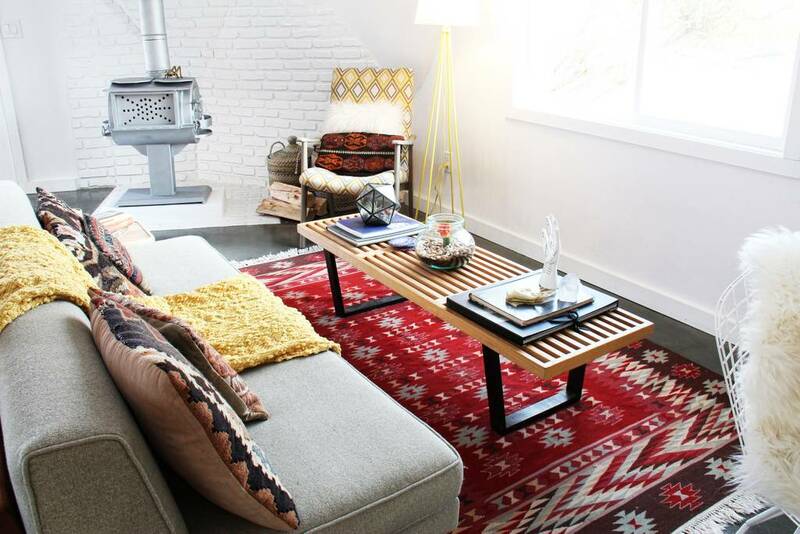 With a 120” projection TV, a ton of common area space, and a huge vanity set up, you’ve got plenty to keep you occupied when you’re not at the festival. If you really want to live it up, you can arrange for a pre- or post-festival facial or massage. 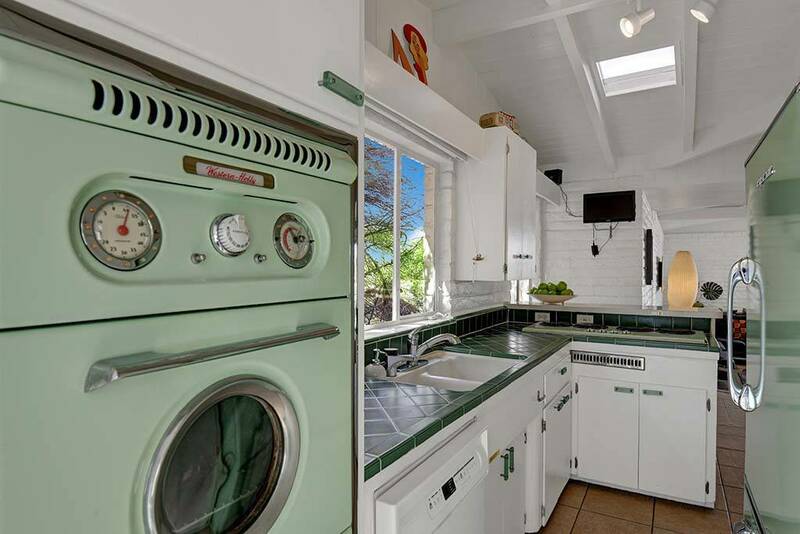 Make sure to book this highly desirable Coachella Airbnb as early as possible. Just two blocks away from the festival grounds it’s in very, very high demand! Even if you’re not that into golf, it’s going to be very hard to go back to life without a putting green after this. 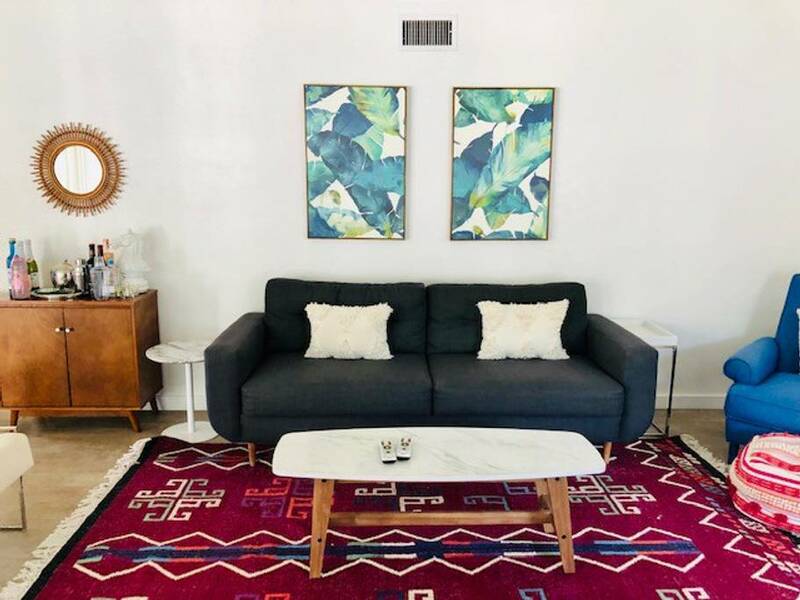 Sophisticated and spacious, this four-bedroom Indio Airbnb sleeps up to 12 and is within walking distance of Coachella (and very close to Target and Costco in case you want to load up on food). 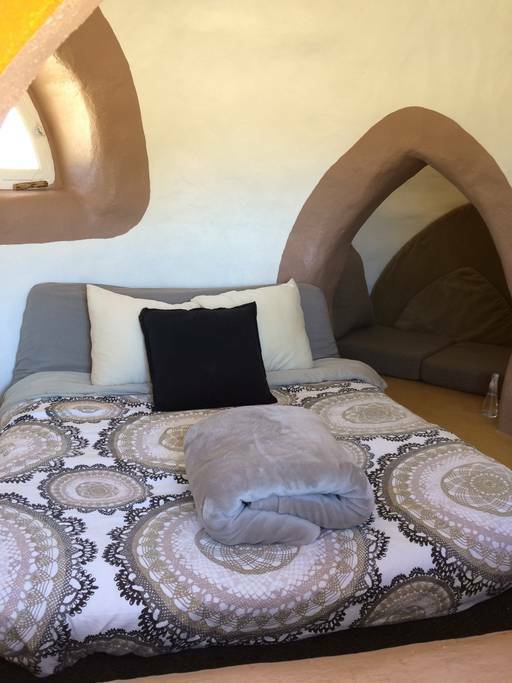 Each bedroom has its own TV and DVD player and the living room has a 55” TV (not to mention a fireplace) in case you all want to watch something together. 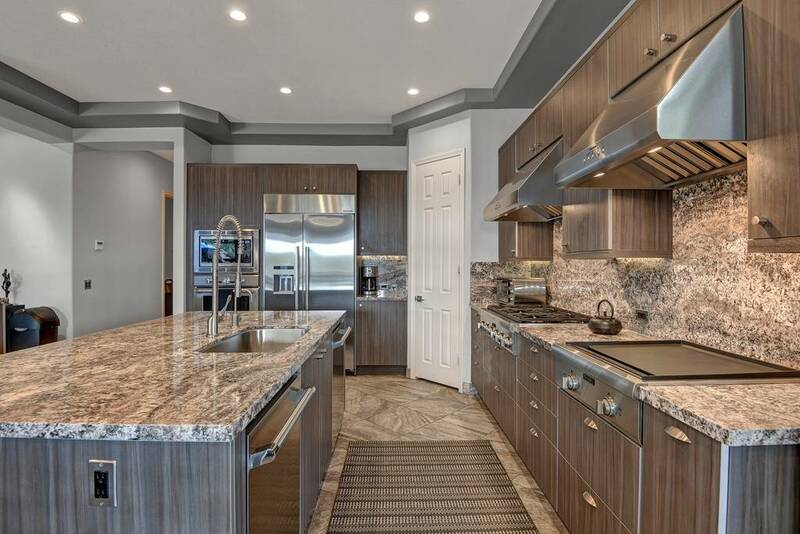 With a big, fully stocked, open kitchen and a great outdoor dining space, you can have meals together before heading out. 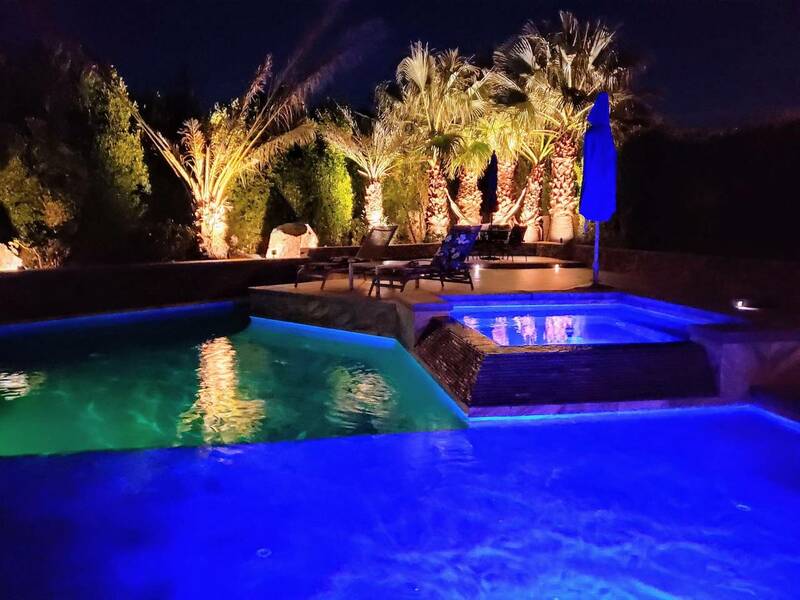 Once you come home from the festivities, come home and soak in the spa or take a late-night swim. 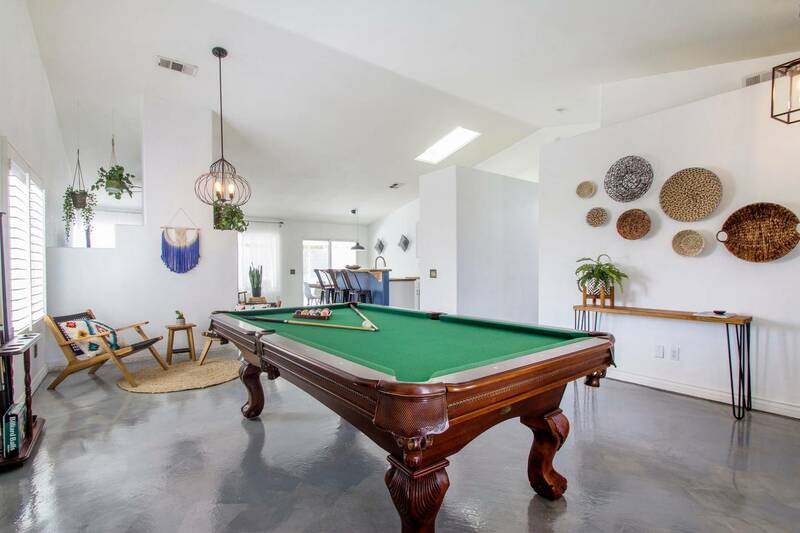 Or even shoot a few games of pool in the pool room! 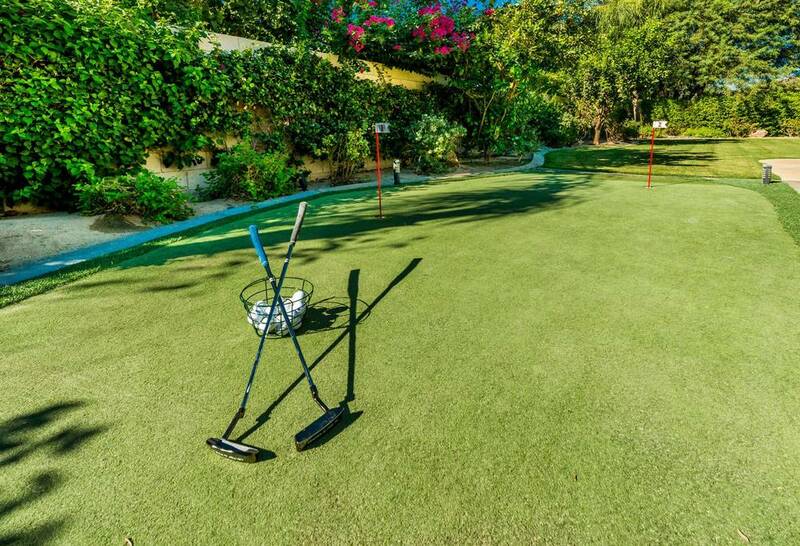 And of course, enjoy the luxury of taking a few putts out on that green before Coachella is over and you have to wait a whole year to come back!